Bobby Schelles, 10-year-old son of Mr. and Mrs. Henry Schelles passed away at the local hospital early last Sunday morning, from severe burns, and injuries received Friday afternoon, when a tornado destroyed the farm home on the old George Land place about 12 miles south of here. The boy, and other members of the family were scalded by hot water which was on the kitchen stove, when the storm struck. The boy was also pinned beneath the stove. The home was leveled by the tornado. 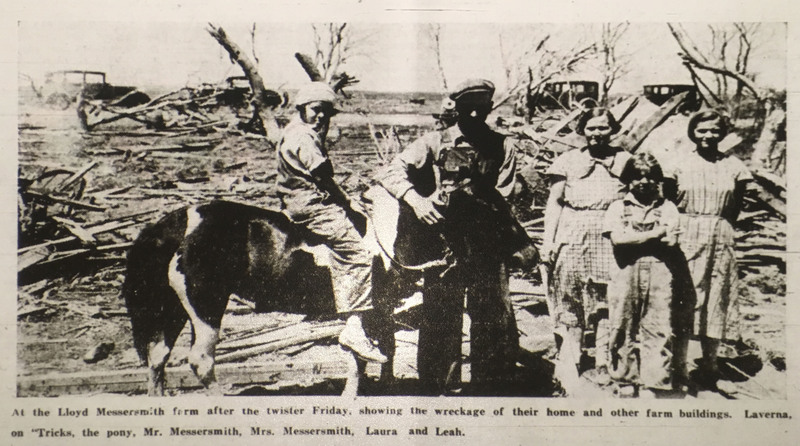 Homes and farm buildings on the farms of Lloyd Messersmith, Donald Nickerson, John Adkisson, John Wear and Harry Stewart, were either demolished or badly damaged by the twister. Showing the Schelles home, leveled by the storm, where three were seriously injured, one fatally. At the Lloyd Messersmith farm after the twister Friday, showing the wreckage of their home and other farm buildings. Laverna on "Tricks," the pony, Mr. Messersmith, Mrs. Messersmith, Laura and Leah. The twister struck at the Lloyd Messersmith place about two miles southwest of the Land farm, along highway 23 S, completely demolishing it. The family were not at home at the time. Two men who were driving along the highway took refuge in the cave at the Messersmith place, and their car was carried some distance by the twister and completely wrecked. Traveling northeast to the Donald Nickerson place it demolished all buildings there except the house. 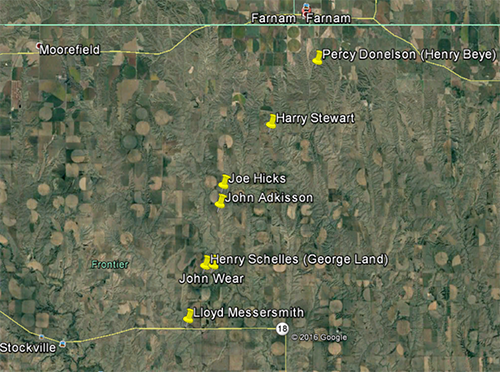 The Land place is about a half mile north of Nickersons, and all buildings were leveled. Trees which surrounded the place were torn up and stripped. At the John Wear farm a quarter of a mile east of the Land place the house and other buildings were badly damaged. 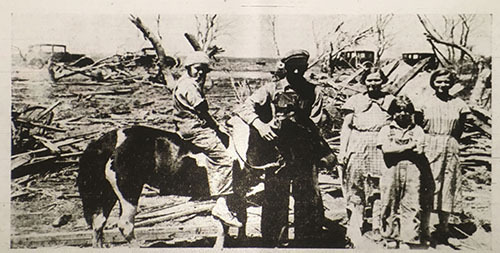 At the John Adkisson place about a mile northeast of Lands it demolished all farm buildings except the house, and it was damaged, beyond repair. At the Joe Hicks place still traveling northeast the windmill, a shed on the barn and a small building were destroyed. 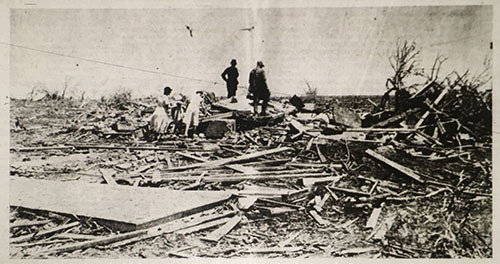 The storm next struck at the Harry Stewart farm about five miles north east of the Hicks place, completely wrecking all farm buildings and damaging the house. When the storm struck the Stewart house all members of the family were in one room. The force of the storm tore the room from the rest of the house, but the family escaped serious injury. All of them were bruised and scratched, however. 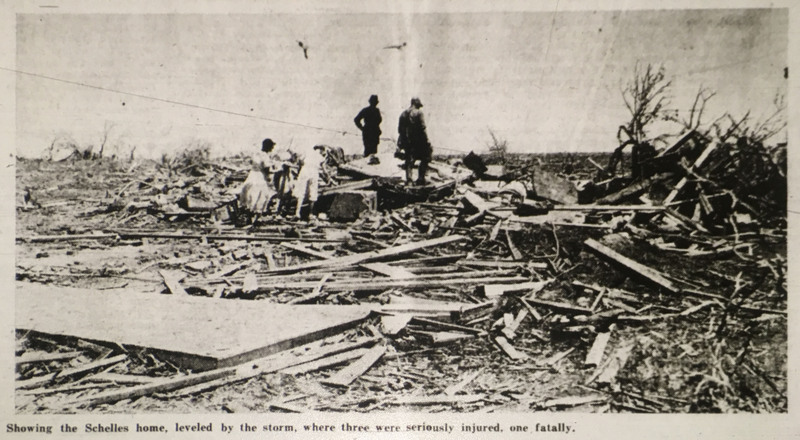 The last place reported to be damaged, was on the A. H. Beye farm, where the Percy Donelson family live, and a corncrib was moved and trees were twisted off, along the north side of the premises. A barn on the Jim Baily place and a garage at Leonard McKnight’s were damaged. Ruby Schelles was brought to the hospital Saturday morning. X-rays showed a fracture two ways on the neck of the humerus and the collar bone was also broken. Fern Land is at the hospital. She is burned badly in several places over the body and chest. She is improving nicely. fences in the path of the storm. So far no livestock losses have been reported. Mrs. John Schmid south of Curtis, was killed by a tornado the same afternoon and several persons were injured, some of them very seriously. Tornadoes also struck near Overton and south of McCook the same afternoon. A woman and child were reported killed near Overton and four or five in the tornado south of McCook. Many of the people south of here watched the cloud as it passed on its road of destruction and some here in town reported seeing the funnel shaped cloud. O. T. Thompson and Dwight Stebbins who were on the highway, 23-S near the Jim Bailey place, were fortunate to be just a short distance out of the path of the storm. They drove into a cut, on the highway and stopped, both getting out of the car. One on each side, and they were both able to see it as it passed. They drove on to Elwood along the highway and returned home by another route. People to the west and northwest of the storm were afforded a good view of the cloud, while those in the path of the storm, were mostly unable to see it approaching. Here in town it was as dark as night for nearly half an hour.